We're going back twenty-five years again to take a look at the shop we have, in another Diary entry, dubbed The Butchered Butcher's Shop. 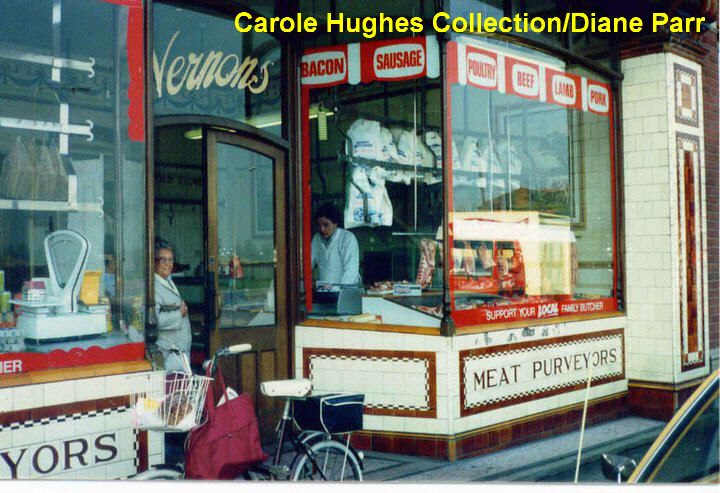 Here we see Vernon's, successors to Fitton's, Butcher's as pictured by Diane Parr in 1987. The obvious problem with trying to use these premises as anything other than a butcher's shop is that the shop was purpose built in the 1920s as such and has, by its very nature, never really lent itself to any other kind of retailing. It's current use as the Balti Spice Takeaway has, at least, brought it closer to its original use as a food retail outlet and, thankfully, the overall look of the building hasn't altered beyond all recognition. In 1987 the shop was nearing the end of its days in the meat retail trade and the red and white vinyl labels affixed to the windows are evidence of what may have been a last-ditch attempt to promote the idea of buying meat from local shops. 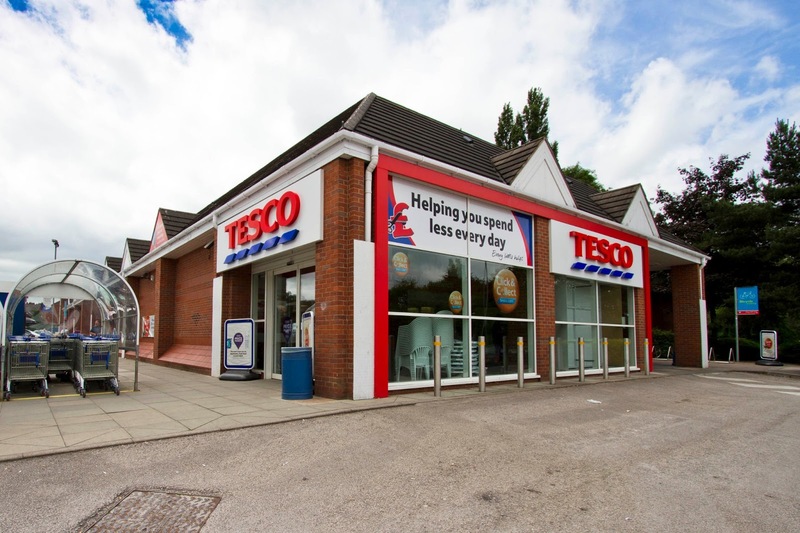 We were, of course, well into the supermarket age by this time and people were getting used to picking up their Sunday joints as part of the regular weekly shop, be it in Middlewich, Winsford or Crewe, rather than using their local butcher's shops. Just discernible through the windows are those priceless, and now lost for ever, Italian tiles and all the accoutrements of a traditional butcher's shop, including the very evocative scales on the left hand side of the picture. In front of the shop is a bicycle, festooned with shopping bags and baskets which even the most careless of reporters could never mistake for a Raleigh Chopper. It has, of course, got to be a Raleigh Shopper, or something of the sort. We'd love to be able to identify the people in this photograph. Does anyone recognise them? 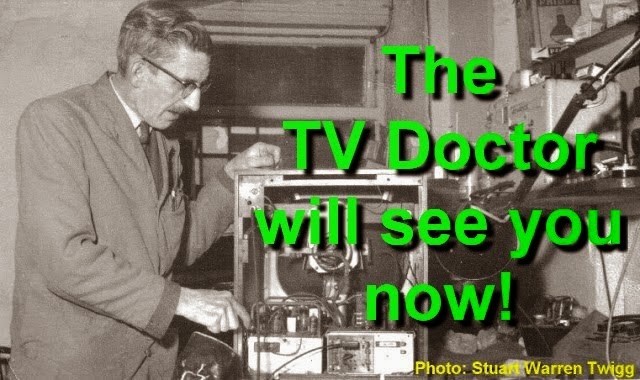 Ann-Marie Hunter: I remember this as a butchers! Robert Sheckleston: The lady standing in the doorway is Mrs Mary Plumb, my auntie. Throughout the year the weather in Britain has been, to put it mildly, somewhat extreme. The early part of the year saw an unseasonal heatwave, leading to hopes of a pleasant warm summer. Instead we had a traditional British summer with more rain than sunshine (although Middlewich's annual events and festivals were lucky and escaped almost unscathed). Towards the end of the summer rainfall records had begun to tumble and talk was of 'the wettest September for a hundred years'. On the 21st of the month the BBC was forecasting that parts of the North-West, including Cheshire could expect 'two weeks worth of rain in twenty-four hours'. 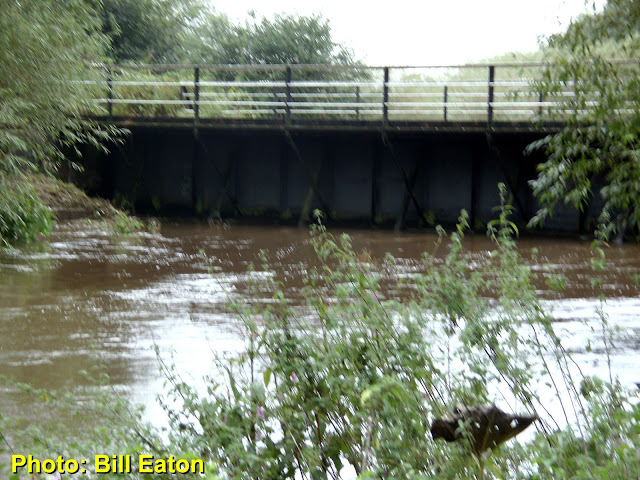 Locally, one sign that the amount of rainfall, even by Cheshire standards, was becoming exceptional, was, as noted here by Bill Eaton, when the Trent & Mersey Canal was breached near to Croxton Aqueduct (though things were even worse near the top end of the canal where it joins the Bridgwater near Preston Brook - a massive breach in the bank there caused massive flooding and meant that the entire section of the Trent & Mersey between the Big Lock and Dutton Stop lock was out of action and many boats were left marooned. 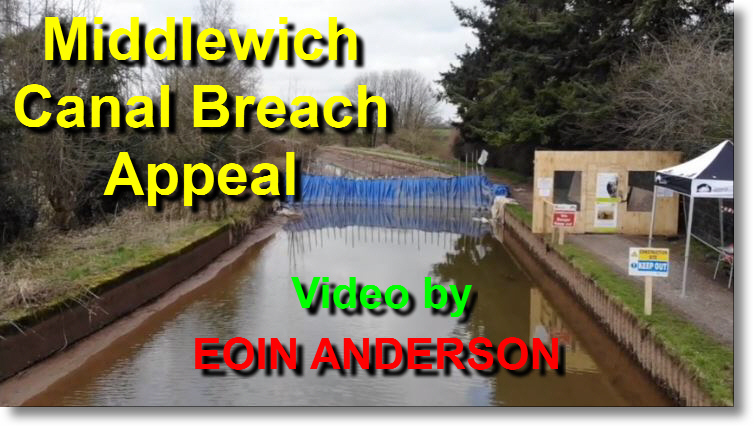 The Canal and River Trust, successor in England to British Waterways, immediately put out an appeal for funds to repair this massive damage to the local waterway infrastructure). Observing that something truly out of the ordinary was happening, Bill Eaton took a walk down to Croxton Lane and took the above photograph. 'I had a walk down to the canal to see the floods. Bullock's Meadow and the Flint Mill were well under water. 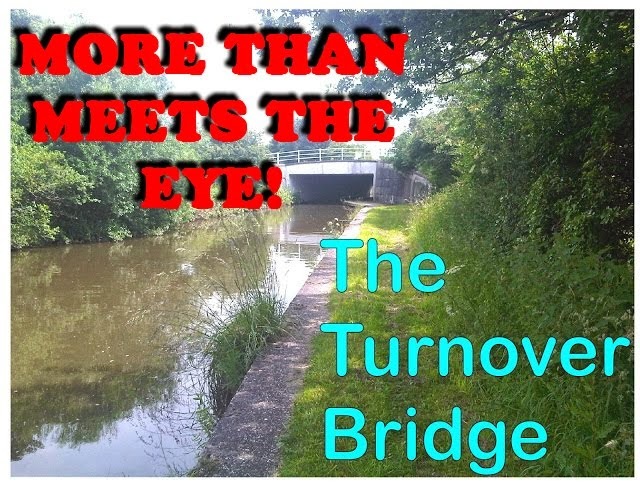 This was caused by the aqueduct bridge (where the canal narrows to half its normal width) being unable to cope with the amount of water flowing into it. The aqueduct was closed off when the canal breached its bank. 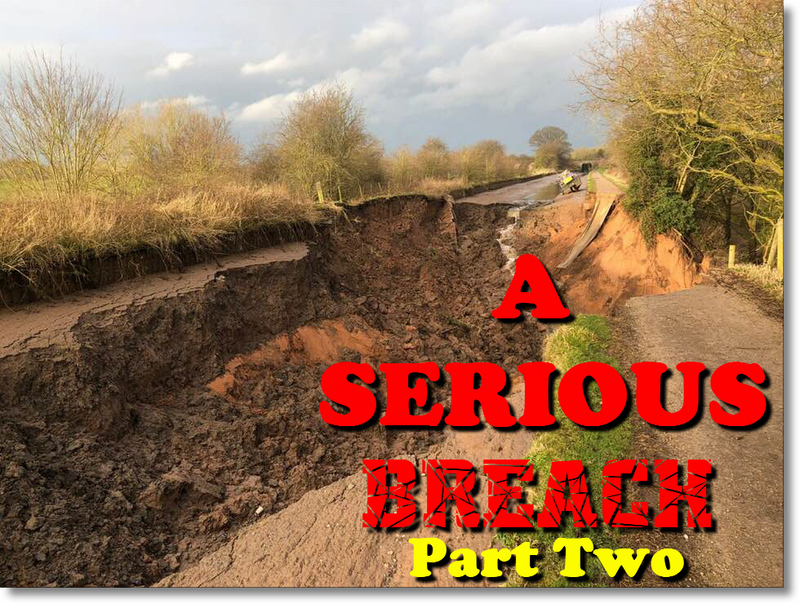 UPDATE (NOV 27th): As November drew to a close, the work to repair the breach at Croxton was nearing completion, although the bad weather continued, with severe flooding in many parts of the country. To mark the season of Remembrance this year we bring you a precious piece of Middlewich history from our private family collection. 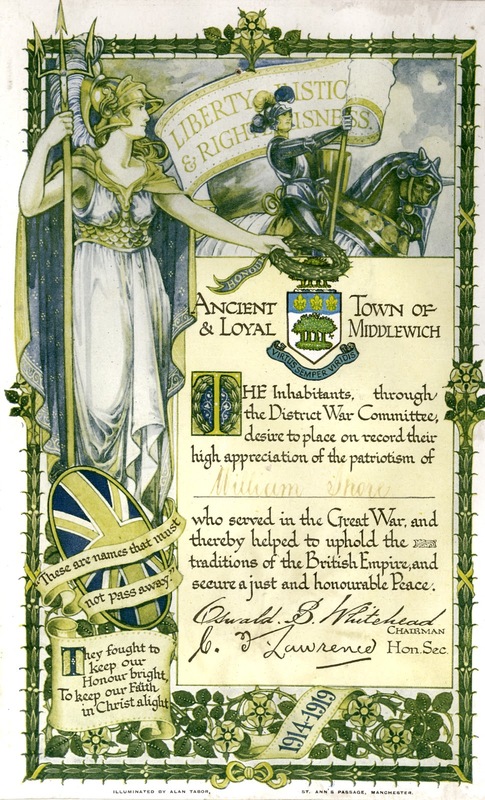 This illuminated document was presented to William Shore of Middlewich in 1919 to mark the town's appreciation of the part he played in World War I, the dates of which, you'll notice, are given as 1914-1919 rather than the more usual 1914-1918. This is because the Treaty of Versailles which, it was hoped, would bring a chance of a lasting peace in Europe, wasn't signed until that year. The years 1918 and 1919 are regarded as interchangeable by war historians. William Shore was my mother's uncle and lived all his life in the town. His son, Harry Shore, was responsible for building number 44 King Street just before the Second World War and this certificate of appreciation was hung on the wall of one of the bedrooms in that brand new house, and stayed there for over fifty years, gradually fading in the sunlight as the years went by. The certificate was signed by the Chairman of the District War Committee, Oswald B Whitehead, and the Committee's Hon. Secretary C F Lawrence, who was, as we've seen before in the Middlewich Diary, a noted Middlewich historian, as well as being clerk to the Middlewich Urban District Council. Mr Lawrence's influence is very strong in the wording of the certificate. He was a staunch patriot and Royalist and never missed an opportunity to stress Middlewich's strong Royalist traditions. The certificate also feature the crest and motto Virtus Semper Viridis ('Virtue Is Always Flourishing') which was used for many years on Middlewich UDC stationery, but never officially adopted as the town's coat of arms due to objections from the College of Heralds. A version of this crest is carved into the back of the Council Chairman/Mayor's chair in the council chamber. 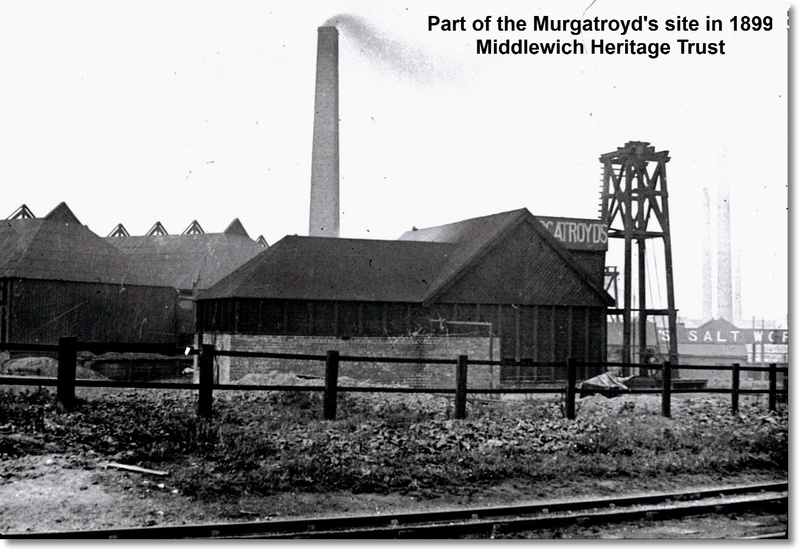 The device was also used as an emblem by Middlewich Heritage Society in its early years. On Thursday November 10th the Middlewich Diary was looking at a well-remembered view of the town centre as seen from King Street and, to acknowledge the time of year when the people of the town come together to remember the fallen, also took a look at Middlewich's main war memorial which, despite all the changes over the years, still stands only a few yards away from its original position in the town centre. 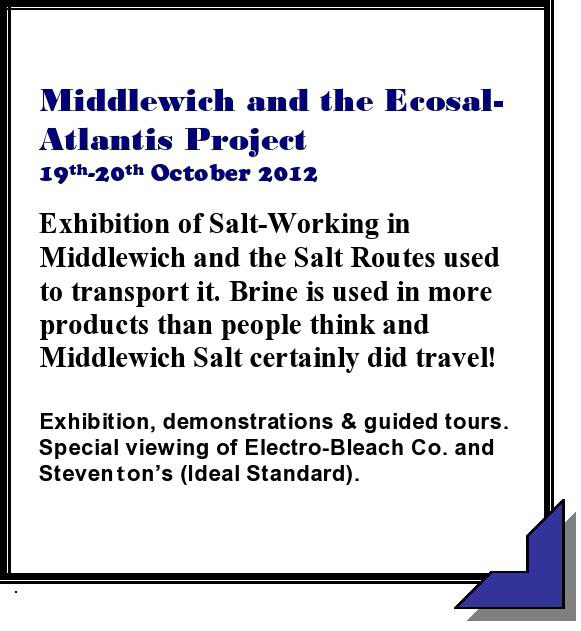 Here's an interesting piece of Middlewich sporting history from just before the Second World War. This Bricker Cup Winners' Trophy was loaned to us by Leo Sykes who discovered it in a house in Sutton Lane which he moved into recently. Now that we have photographed the trophy Leo plans to donate it to the town so that it can be displayed on suitable occasions. 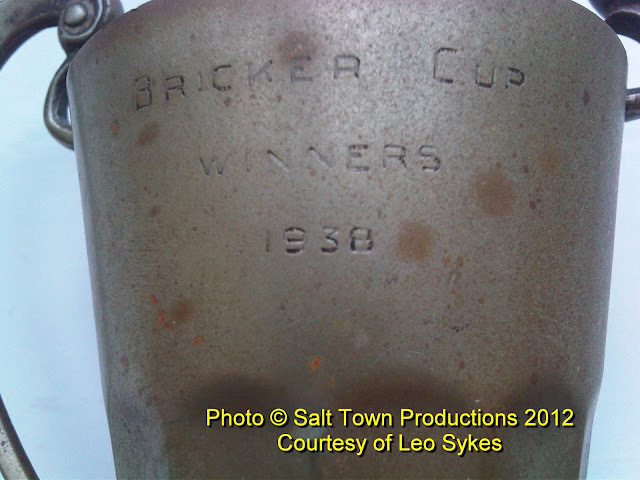 A close-up of the inscription shows that the cup, which is 5 ½ inches high and 4 inches across, was given to the winning team, or a member of the winning team, in the 1938 competition. 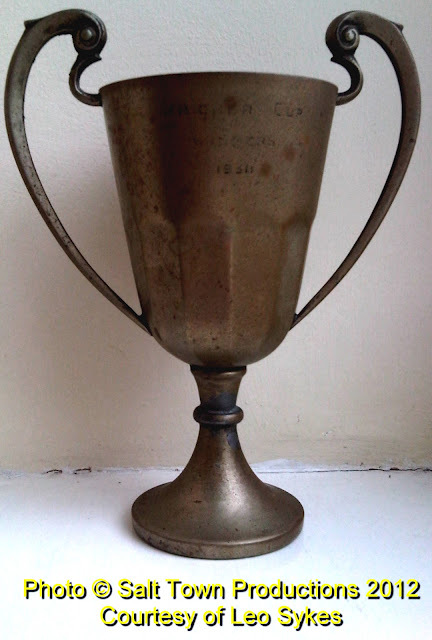 According to Allan Earl's Middlewich 1900-1950 (Cheshire Country Publishing 1994) the Bricker Cup was founded in January 1913 when Mr Bricker 'presented a cup to the Children's Aid Charity Football Committee for the "material benefit of the poor children of Middlewich"'. We're hoping that someone has records somewhere which show which team won the Bricker Cup in 1938. The competition itself has had several revivals over the years, usually as a consequence of the re-discovery of the Bricker Cup Trophy in a forgotten corner of a local pub undergoing refurbishment.. 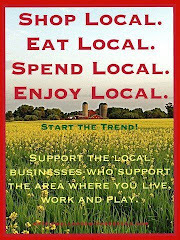 Does anyone have any information on the current 'state of play' as far as this popular local competition is concerned? 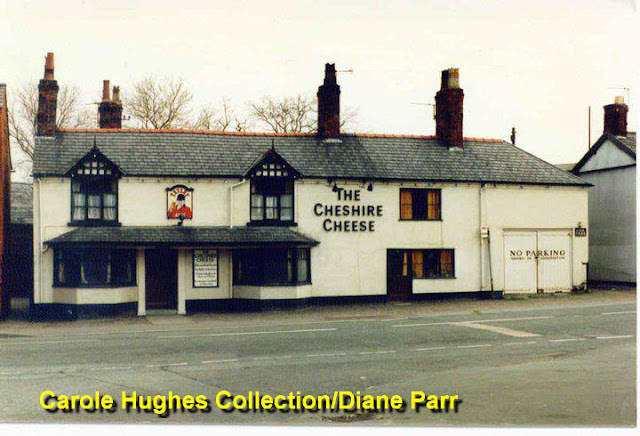 Continuing our series of photos of Middlewich as it was twenty-five years ago, here's one of the town's favourite Lewin Street pubs, the Cheshire Cheese. Always a cosy and welcoming sort of place, 'The Cheese' continues as an unpretentious but well-frequented watering hole. 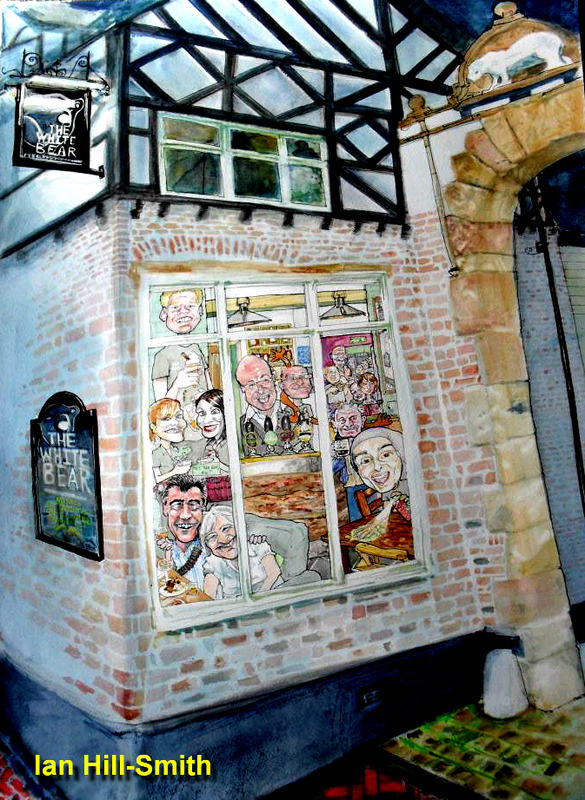 In the last twenty five years the pub has expanded somewhat, while at the same time managing to keep its traditional atmosphere. The licensed premises have now been extended to incorporate the small cottage to the right of the 'Cheshire Cheese' sign and the former car park at the rear (indicated by the small black and white sign on the extreme right) has been transformed into an excellent outdoor performance area which has been well-used for Middlewich Folk & Boat Festival and Middlewich FAB Festival Events. Geraldine Williams: It's a good many years since I was last in The Cheshire Cheese but I do remember that at Christmas they used to cover an entire wall with fir branches and fairy lights instead of having a Christmas tree (probably because of lack of space) and how effective it was. Robert Sheckleston: Always been a great little pub. The last time I had a pint in 'The Cheese' Graham Woodbine was the landlord. Until relatively recently the section of Warmingham Lane between Cross Lane and the Middlewich town boundary had a semi-rural aspect, consisting of fields with just a sprinkling of houses. All that, of course, has changed and looks likely to change even more in the next few years. Its been a while since I sent you anything so here are a couple of photos I took. Time for a look at Cledford? They came to mind as a further housing development is going ahead in Warmingham Lane, not without the usual protest I see! protest then, as I remember. Mike's referring here to the controversial plans for 350 more houses in the area. The corner of Wheelock Street and Southway as it was in the early 1970s when the Alhambra,in common with so many former cinemas at that time, was a part of the blossoming craze for bingo. Like the cinema before it, this new incarnation of the Alhambra was very popular, with patrons being bussed in from as far afield as Stoke-On-Trent to take part in games. 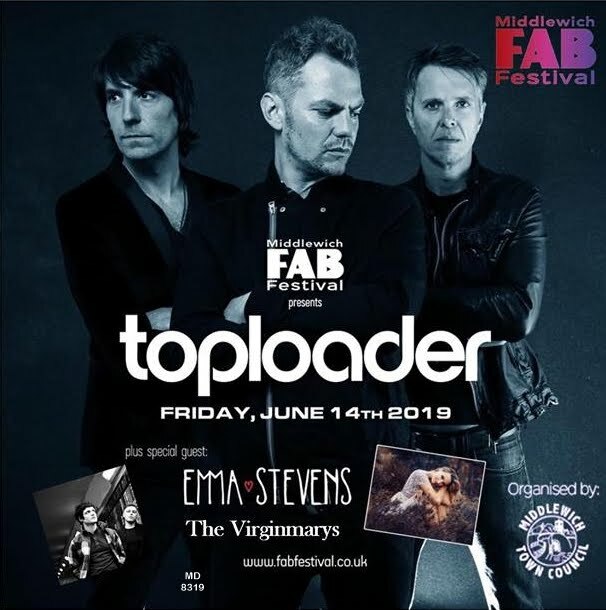 At this time the building had not been radically altered for its new role and rumours abounded that the projection equipment had been left in place and could be brought back into use if required. The projection room was situated high above the entrance, behind the middle window, and there is a local legend that one of the projectionists carried on a courtship with his girlfriend who lived above the chemist's shop on the other side of the street. The entrance lobby was later altered to become an amusement arcade and a section of the upper part of the building became a snooker club. 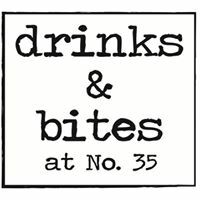 Next door is James Vernon and Sons' furniture shop,now home to Drinks and Bites at No 35, and, on the other side of Southway, is the off-licence which later became part of Bargain Booze before closing in 2013 and re-opening once more as an independent off-licence. At the time of the photograph it was, as can be seen, extolling the virtues of Watney's Pale Ale. In the intervening years the bottom end of Southway (the former 'Tannery Alley') has developed from a mere access road to the flats above Vernon's shop, and the rear of the Alhambra, into a pedestrian walkway with hairdressers and flower shops and the Wheelock Street entrance to what is now Tesco's main Middlewich supermarket. 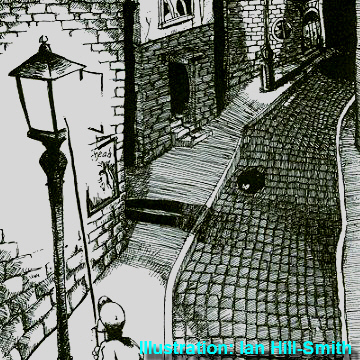 Here's a link to Ian Hill-Smith's Id Illustrator Facebook page, featuring drawings, cartoons and illustrations from this talented artist who lives in Pepper Street. Ian can provide 'a unique and personal gift for a birthday, or an anniversary, or to commemorate an achievement. 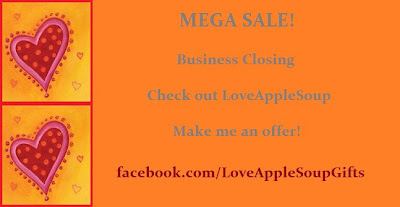 Perhaps something original to promote your business or event? 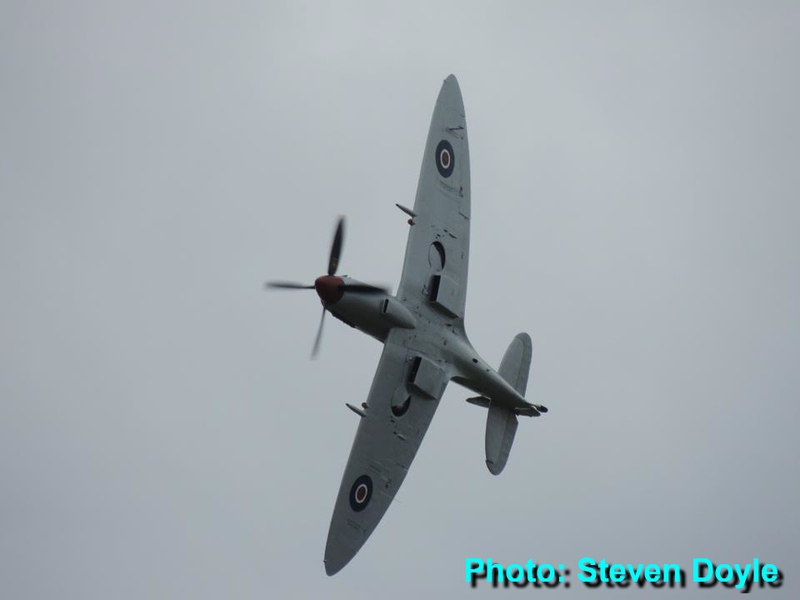 WINGS OVER MIDDLEWICH: One of the highlights of Middlewich's second Wartime Weekend was a flypast by one of the most potent symbols of wartime Britain, a Spitfire, at 2.55pm on Saturday 22nd September. 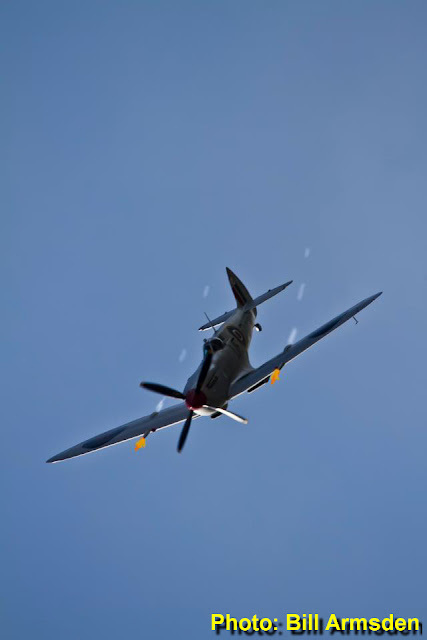 Here's Bill's photo of the plane, suitably amended to give an impression of what it must have looked like in action. The title of this diary entry was chosen by Bill as a tribute to the Spitfires and their crews. Into the realms of Fantasy now with this picture with Photoshop fake gunfire... ahhh boys own paper stuff. Built at Castle Bromwich and delivered to 9 MU Cosford on February 4th 1944. Allotted to 443 (Canadian) Sqn on March 11th 1943 it carried the code 21-V. Used extensively on operations leading up to D-Day it was assigned to 83 Group Support Unit on August 8th 1944. Then conversion to an instructional airframe at No 1 School of Technical Training at RAF Halton in October 1945 with serial 5690M. In 1951 it was transferred to RAF Hawkinge for gate display duties carrying the serial M5690. 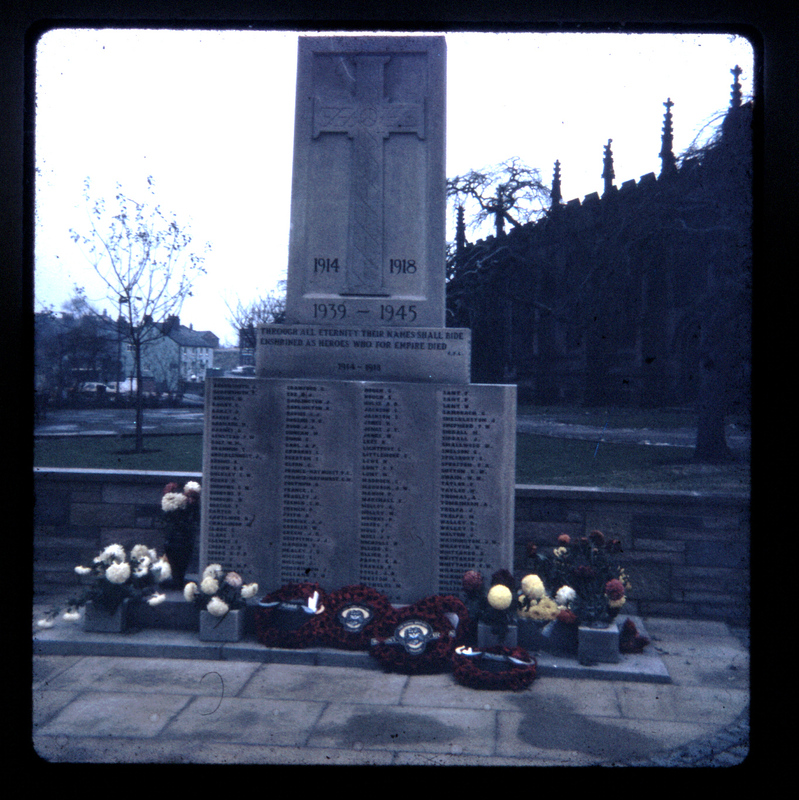 After some restoration work at 71 MU RAF Bicester in 1961 it was erected on a pole at RAF Locking for some years before allocation to the 'Battle of Britain' film unit at RAF Henlow in October 1967. Carrying the spurious serials and codes N3328/AI-R & N3317/BO it was filmed at North Weald and Duxford. Temporarily stored at RAF Henlow after the film on August 8th 1969 it joined the RAF Museum Reserve Collection based at RAF St Athan. Over an 8 year period it was restored to flight on November 7th 1997. Joined the BBMF on November 14th 1997. Shortly to be temporarily based at RAF Barkston Heath, Lincs. while the runways at RAF Coningsby are renovated. The aircraft is presented as a clipped wing LF Mk IX and carries the only markings it ever wore operationally as 21-V of 443 Squadron RCAF. MK356 was flown in to Duxford in October 2007 for 6 months maintenance to be carried out by the Aircraft Restoration Company and will include a repaint, replacement of the MK500 Merlin engine with a M266 Merlin engine to return the aircraft to build standard, and a respar of the wings will be necessary (Major maintenance of the BBMF fighters will be carried out by the Aircraft Restoration Company (ARCo) based at Duxford near Cambridge, for the next 5 years with an option to extend to 7 years). The new paint scheme will depict a 601 Squadron aircraft based in the Italian theatre in 1943. Presented as UF-Q, MJ250 of No 601 ( County of London ) Squadron the aircraft of Flight Lieutenant Desmond Ibbotson DFC. She is now in a silver paint scheme used during late 1944 when the Squadron carried out fighter bomber missions over the Balkans from bases in Southern Italy. A more detailed history can be found on the RAF's BBMF website. 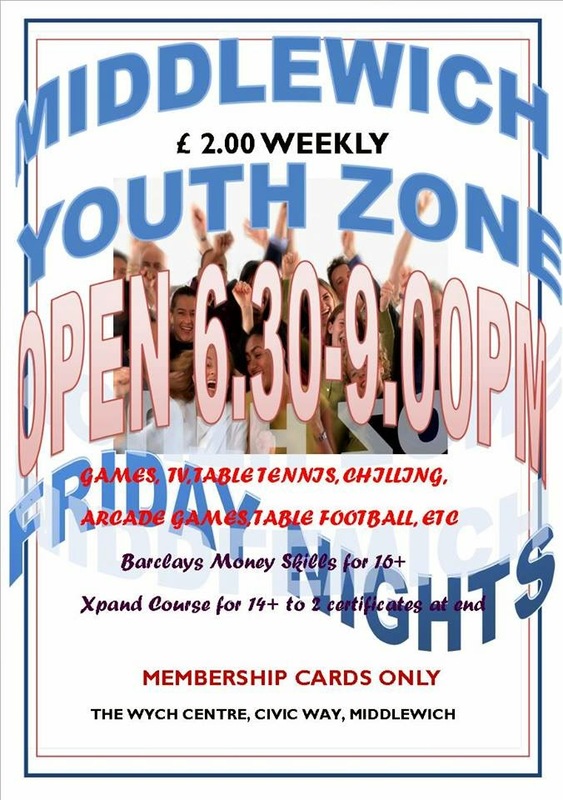 is a not for profit organisation who work with nearly 40 local children every week! At 2.55pm on Saturday 22nd September one of the enduring symbols of Wartime Britain, a Spitfire, flew over Middlewich as part of the Wartime Middlewich Weekend and Steven Doyle was on hand to capture this excellent picture of the iconic plane. The spirit of wartime returned to Middlewich over the weekend of September 21st -23rd 2012 as the second Middlewich Wartime Weekend hit town. 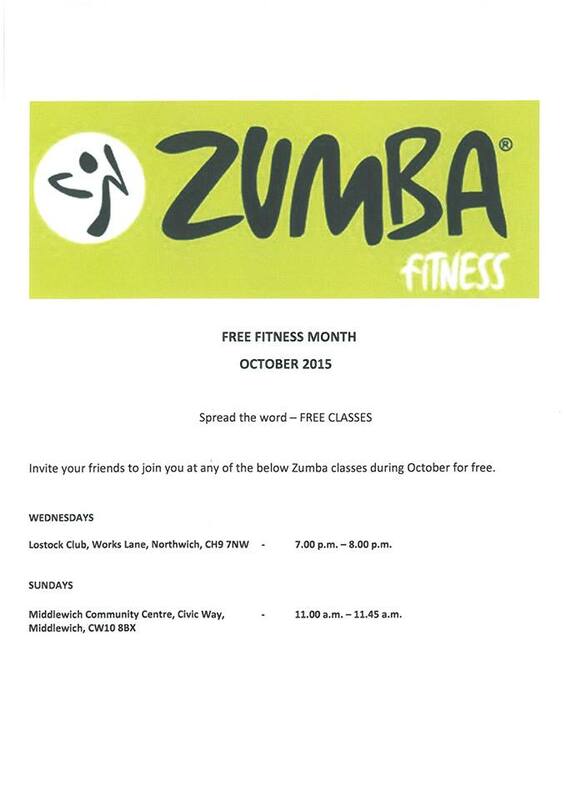 Details of the events organised can be found here. 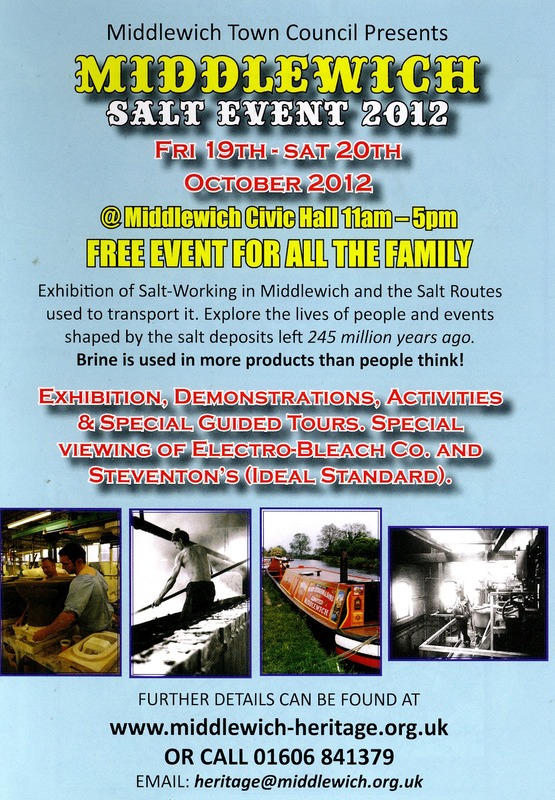 Chris Frost: I have to say that I'm immensely proud of the efforts that Middlewich people put in to events like this. 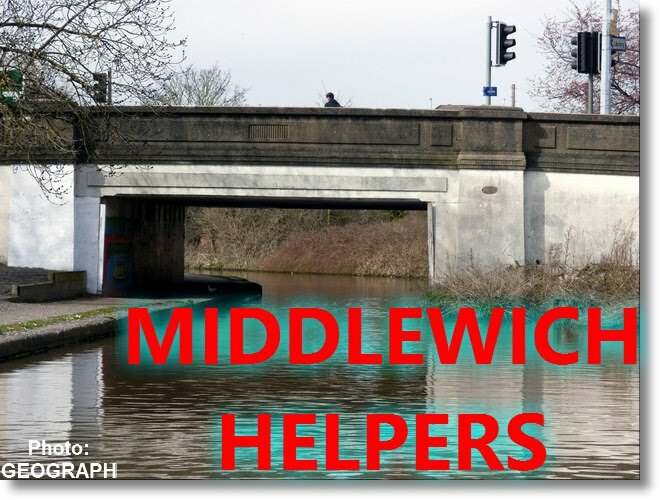 Organising something like the Middlewich War Weekend and the other events is no small feat and it says a lot about the dedication of those who work so hard to make these things happen. Outstanding. Thank you! 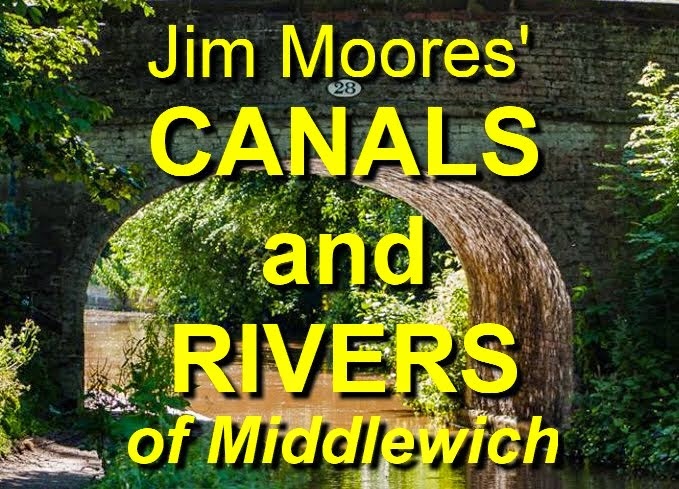 Jim Moores: I would just like to express my appreciation to all those involved in organizing this and all the other festivals (FAB, Roman, Norman etc) that we are very lucky to have in Middlewich throughout the year. Thank you very much! 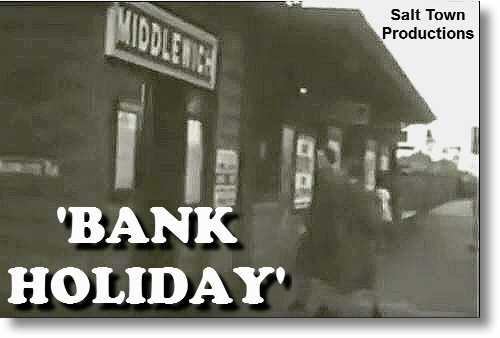 Bill Armsden: Just thinking about the weekend we have just had in Middlewich! Wow, wow and wow again. 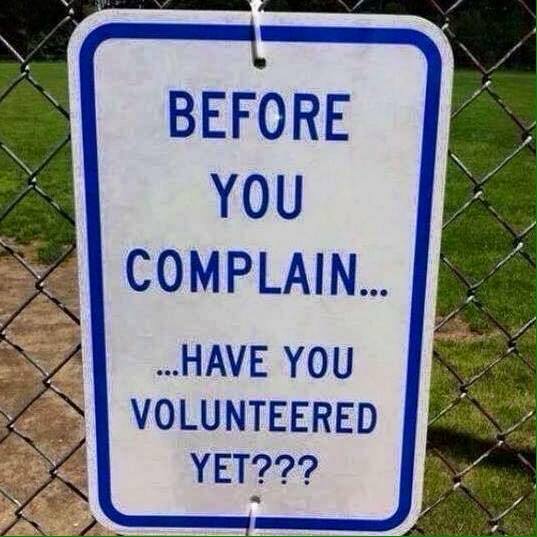 To the hard workers who were responsible for planning and staging the event.... thank you. To all the people who took part and made it a success.... thank you. To the weather, thank you for a great Saturday and most of Sunday. To a great big band night at The Legion with The Wych Band, stompin' heaven!!! 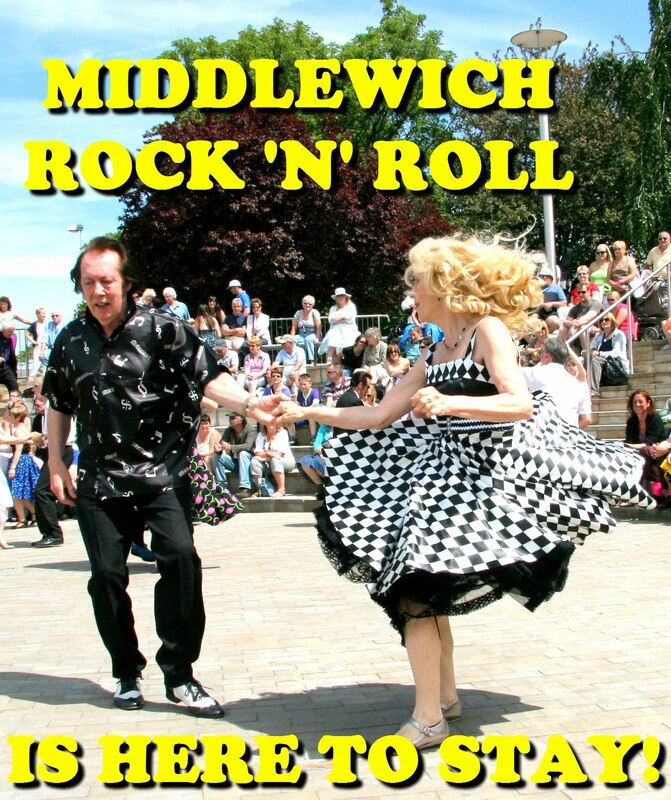 And to all the venues in Middlewich putting on 40's entertainment...... Thank you. 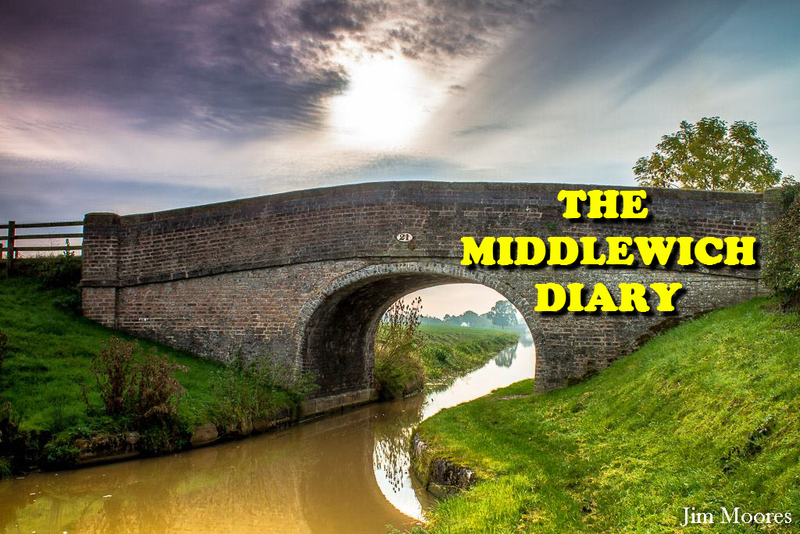 COMING SOON - THE MIDDLEWICH DIARY GUIDE TO SHOPS IN WHEELOCK STREET! 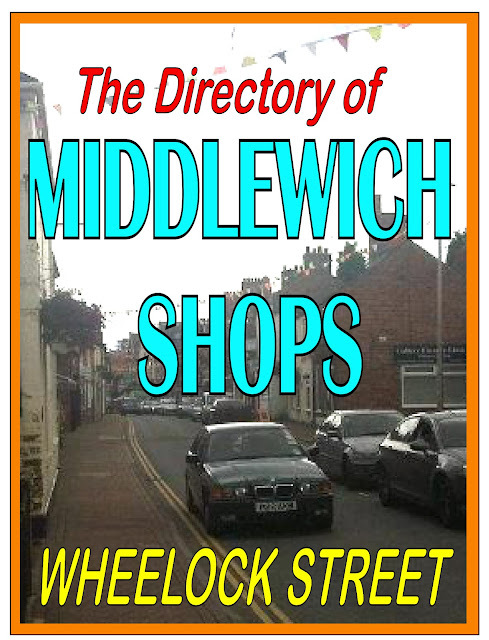 Coming soon to The Middlewich Diary - The Guide to Middlewich Shops - Part One, Wheelock Street. 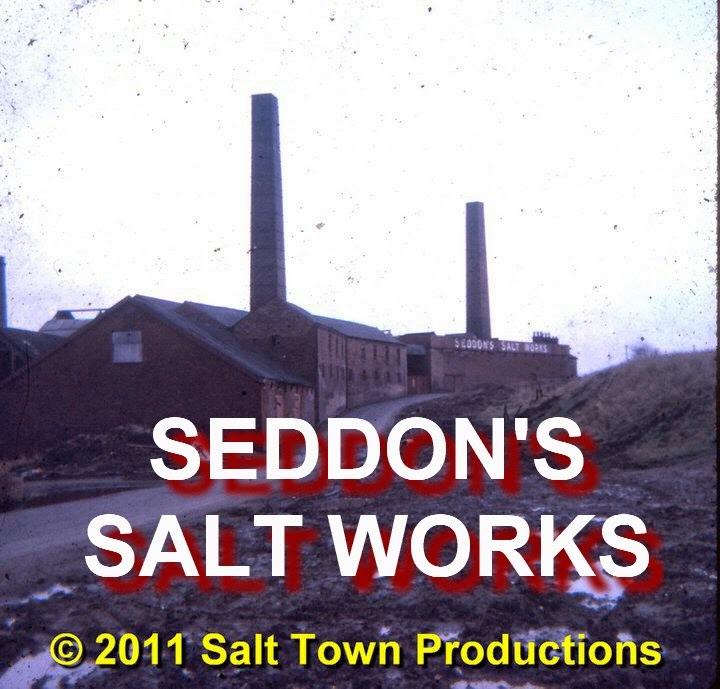 Part Two will feature Lewin Street and Part Three Hightown. Future plans include a directory of home businesses and much more. Please keep an eye on the Middlewich Diary for the latest news. have to say about this new iniative. The Middlewich shops directory for Lewin Street, Hightown and Wheelock Street is complete apart from topping and tailing some of the shops that open infrequently. Sad news announced in the last few days, after 33 years of trading in Middlewich, Ken and Shirley at Davies Tropical/Shirleys Wool shop have put their building/business up for sale. Good luck to them in their retirement and travels in their motorhome. Another business up for sale in Middlewich is Cash's Garage. The Foodamentalist Gluten Free Bakery in the old Reid's Bakery is behind schedule for opening and the revised opening will be mid-November. Initially, they expect to open Thursday, Friday and Saturday. 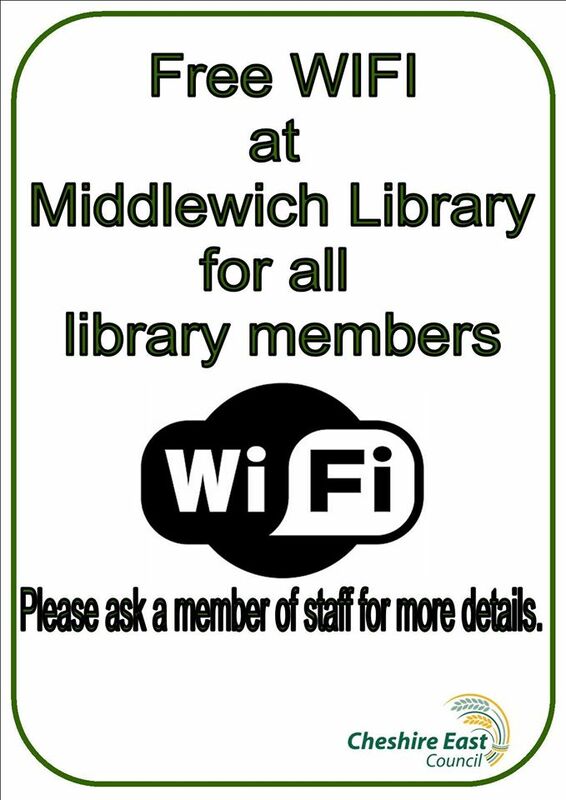 Middlewich is soon to loose its Conservation Area status soon due to amount of new building that has taken place. 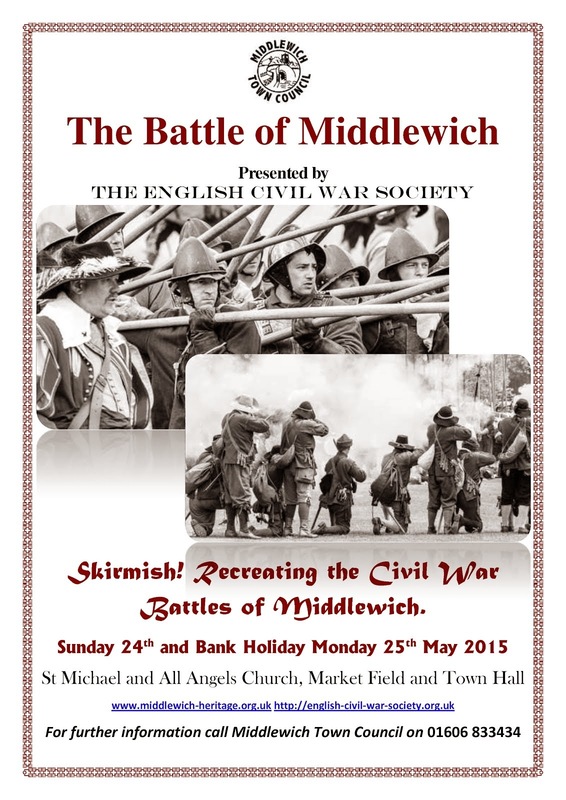 Things are about to start changing in Middlewich. 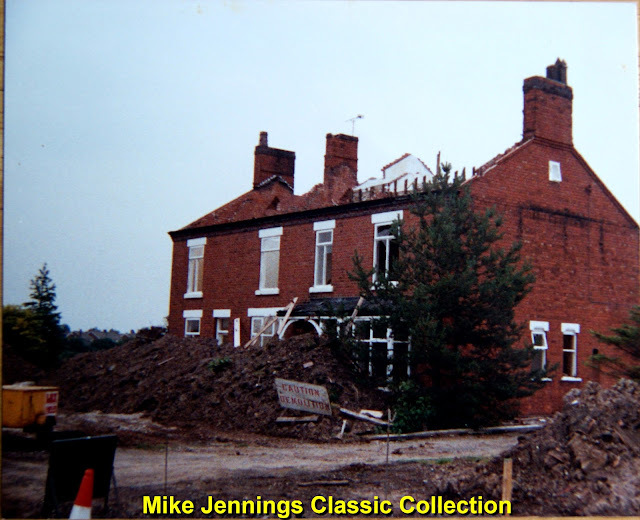 Another from Carole Hughes' collection showing Middlewich as it was twenty-five years ago. 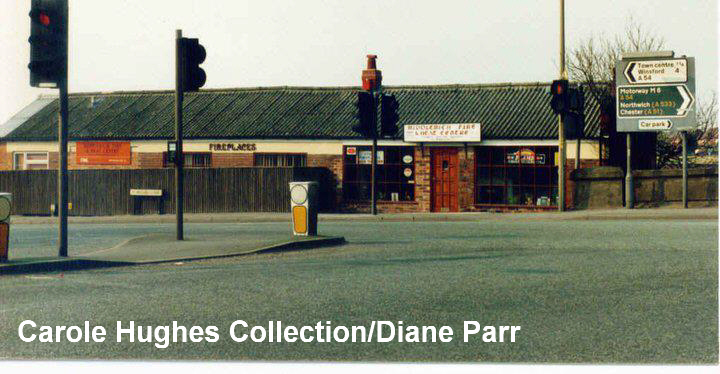 Here we see a long, low building which still survives today and was, for many years, the home of Jaygee Fireplaces. Built on a high bank overlooking the 'new' town bridge itself, this was the first building on the right hand side of Lower Street as it led from the town bridge towards the Bull Ring. Hidden behind the traffic signs on the right is a brick facade with the name of the firm on it, designed, probably, to give the building a more imposing look when viewed from the town bridge and Kinderton Street. This facade has now disappeared. The survival of this almost temporary looking building when so much in the area was demolished is probably due to its somewhat isolated position away from the main shopping area. Never a particularly attractive building, it nevertheless lives on with a new roof and in a much smartened up condition as the Town Bridge Estate Agency. Geraldine Williams: I don't know when Jaygee started trading, but we certainly had a fireplace from them when we were setting up our first home in Kinderton Street in early 1961! 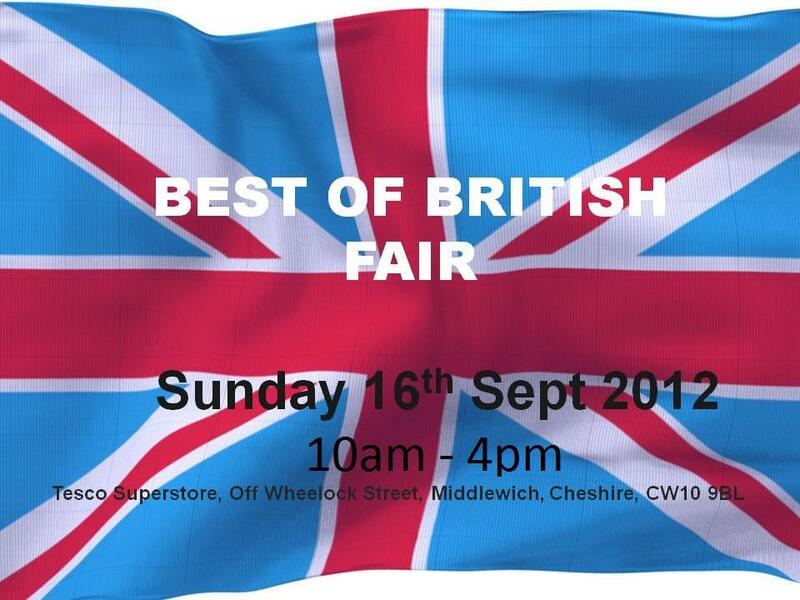 Don't forget the Best of British Fair today on Tesco car park 10am - 4pm. 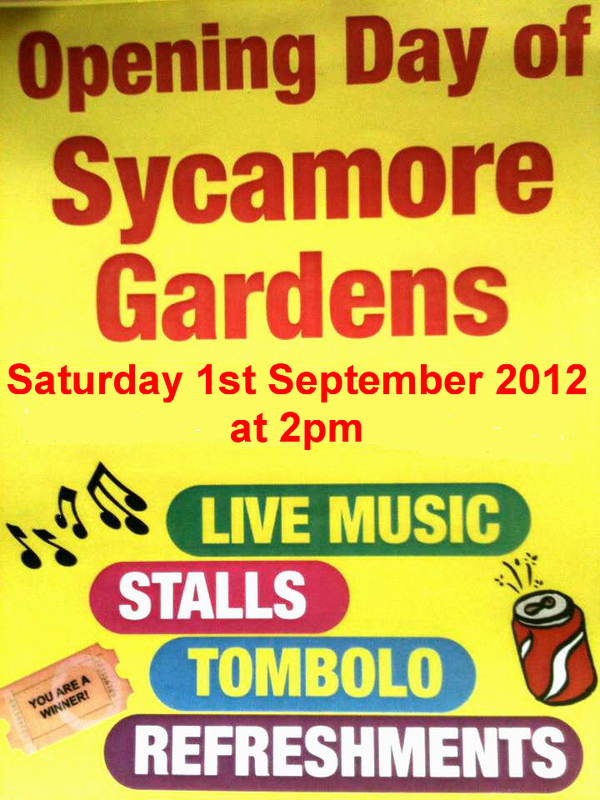 Lots of stalls, kids activities, fairground ride, hook a duck and performances from Dancercise and the signing choir. This is one of a series of photographs taken after dark in Middlewich by Bill Armsden, Jim Moores and Tom Harry Johnson as they experimented with various lenses, filters and lighting equipment to produce some remarkable visual effects. 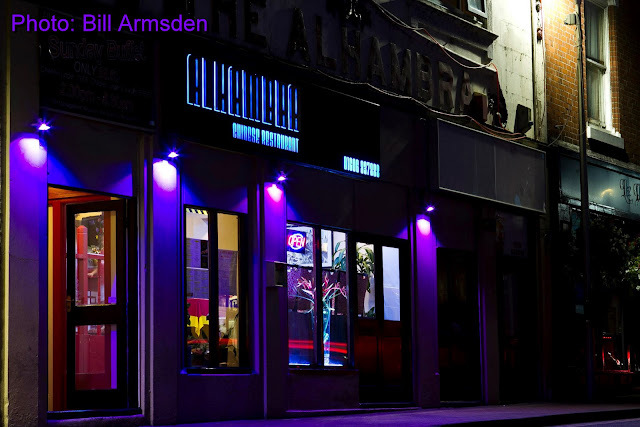 In this one we see the familiar face of the Alhambra building which started life in 1920 as a cinema and served time as a bingo hall, snooker hall and amusement arcade before becoming a chinese restaurant. The original Alhambra was a palace in Granada (the one in Spain, not Manchester) and the name translates literally as 'The Red Palace'. The use of the name for a Chinese Restaurant may seem a little inappropriate, but it has meant that the building has retained its original name and, just as importantly, the raised lettering on its frontage which has remained there throughout the building's changing fortunes, giving a pleasing sense of continuity. Notice in the top right hand corner of the photograph how the street lamp adds a little touch of workaday reality to the scene and gives an idea of just how old the building really is, contrasting nicely with the glamorous coloured lighting at the front of the building. The overall effect of the photo is, simply, stunning. Labels: ALHAMBRA, ALHAMBRA CHINESE RESTAURANT, BILL ARMSDEN, MIDDLEWICH BY NIGHT. 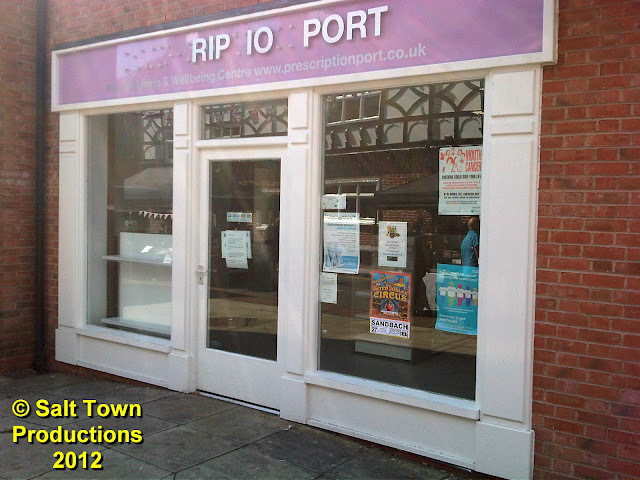 The curious case of the shop which wrote its own epitaph. 'Prescription Port' established itself in one of the shops in the new housing and shopping development in Wheelock Street, opposite the White Bear (which can be seen reflected in one of the shop windows as it basks in the warm July sunshine) just a few months ago and closed after less than a year, leaving BetFred as the only surviving business in this rather prestigious looking row of shops. 'Prescription Port' itself is a bit of an enigma. There are (or were) branches in Ellesmere Port, Runcorn, Winsford and Sandbach and it is obviously, as the name implies, a firm of chemists. 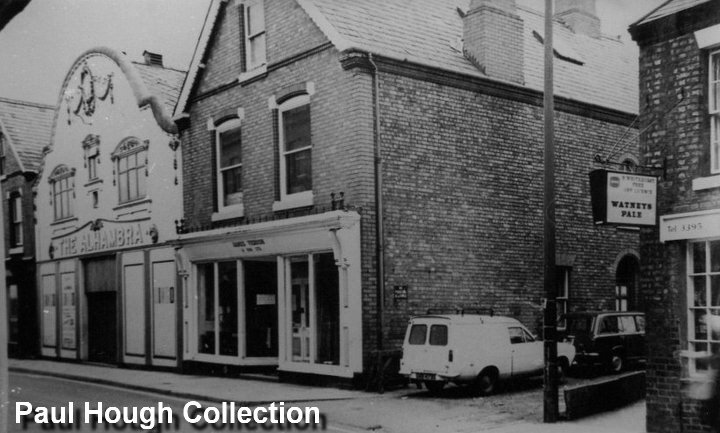 But why it should be thought that there was room for a third chemists shop in this small town, with the trade so obviously firmly sown up by Rowlands, is not clear. Then again perhaps the competition from Rowlands was not the real reason why the shop closed - that website address brings up the name DAVID STEARNE LTD, a pharmaceutical wholesaler which also owned a chain of pharmacies but was forced to go into receivership a short while ago. The metal sign started to fall to pieces almost as soon as it was erected and, by the time the shop closed, the first part of it read, as can be seen in the photo, RIP. Perhaps it would be a kindness if someone removed the other remaining letters? On a lighter note, you will notice the poster for Peter Jolley's Circus in the window. Observant readers will be able to date this photograph exactly, because also reflected in the shop window is one of the stalls belonging to the Artisan Market. Our picture must, therefore, have been taken on the 28th July 2012. Jain Talbot: Such a shame, as the staff were really nice and you didn't have to wait ages! SEND THEM SOME MORE HANGING BASKETS! 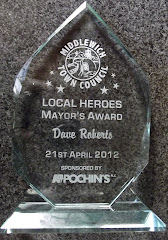 There's a perception in Middlewich - maybe it's more than a perception? 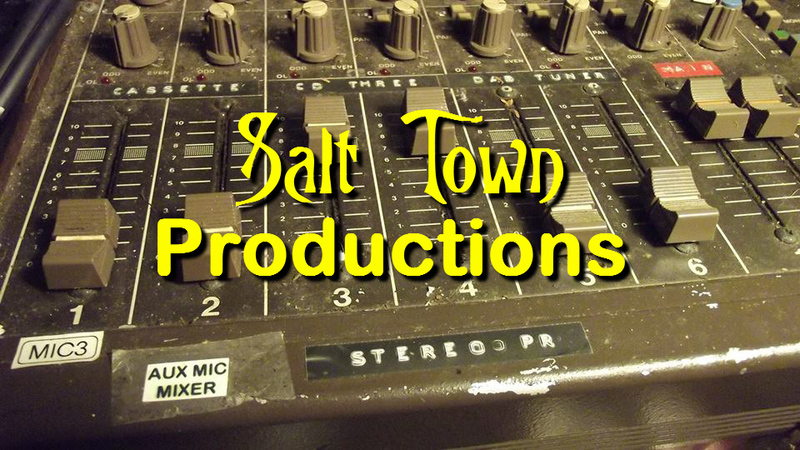 - that the town is pretty hard done by when it comes to local government services and amenities. It was, of course, ever thus. 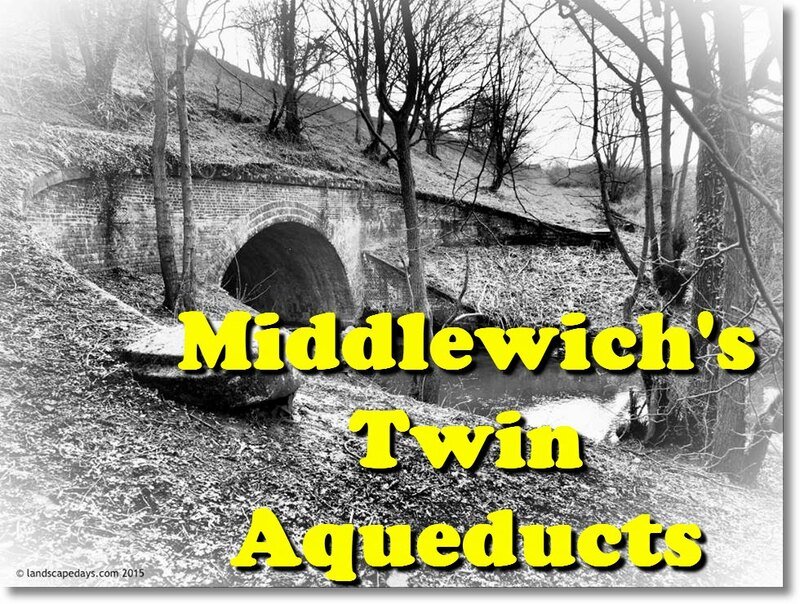 There are those who would say that, with the latest council re-organisation, Middlewich merely progressed from being the 'forgotten town of Congleton Borough' to being 'the forgotten town of Cheshire East'. Back in August 1985 the old Congleton Borough Council, of which Middlewich was an anomalous, unlikely and (as far as its people were concerned), somewhat unwilling part, was only eleven years into its thirty-five year history. 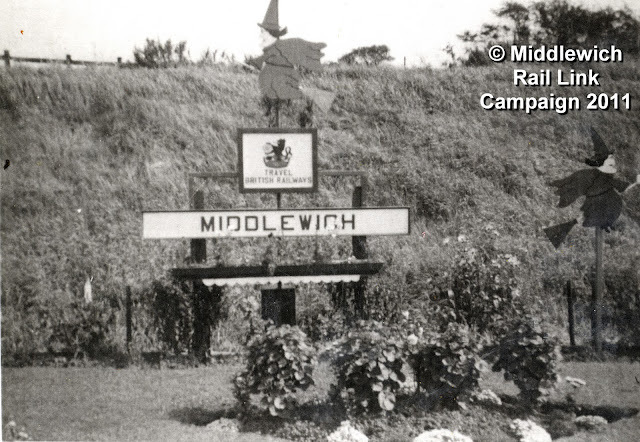 Many people thought that Middlewich was getting 'a raw deal' from Congleton, paying high rates (forerunner to the present Council tax) and getting little in return. At that time, it so happened that I had recently been studying the art of comedy scriptwriting - the rhythmic sequence of a scene; conciseness, the importance of characterization and all the rest of it. One of the exercises was, unsurprisingly, something along the lines of 'write a short comedy sketch involving two characters and tackling a topical issue in a humorous way'. So I had a go, and Nigel and Bill were the result. In the first draft, they were called Neil and Clive, fact fans, but the names didn't sound authentic. 'Nigel' of course, is a name just made for local government and 'Bill' became his partner as an oblique reference (it says here) to the fact that 'Bills' were all you ever seemed to get from the council. I was reasonably pleased with the result, gave it the title 'The Congleton Council Hanging Basket Sketch' and decided to send it to the editor of the Middlewich Chronicle (being careful, as always, to retain the copyright) to see what he thought. To my (slight) embarrassment, rather than giving me his opinion, good or bad, said editor merely published the entire thing on the letters page. The hanging baskets mentioned were an early attempt to 'smarten up' the town centre at, it seemed to me, minimal cost to the council. 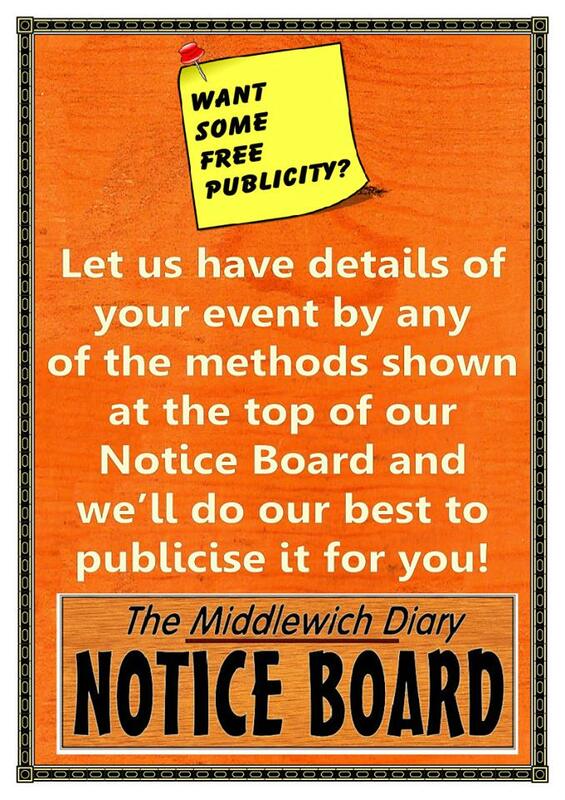 Thus the council could be seen to be 'doing something' about the eternal shabbiness of poor old Middlewich. The trouble being, of course, that the hanging baskets were the only idea they seemed able to come up with, and the town soon became festooned with the things. 'One trick pony' is the phrase that springs to mind. The 'Hanging Basket Sketch' was just the first in a whole series of Nigel and Bill sketches published in the Chronicle, featuring ever more elaborate council schemes aimed at doing poor old Middlewich down and keeping all the money in Congleton. 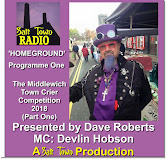 One sketch was written for radio and was recorded by myself and a member of the town council for broadcasting on community radio (this was long before the days of the now-defunct Cheshire FM). But this is the sketch everyone remembers. At the time and ever since, when the subject of Middlewich and its place at the bottom of the Council pecking order has been raised, 'Send Them Some More Hanging Baskets!' was, and is, the cry. To its eternal credit one department of the old Congleton Borough Council joined in with the joke and sent out Christmas cards featuring hanging baskets one year (presumably 1985). Or so I was told. I never saw one of these Christmas cards. If anyone has one, I'd love to borrow it. 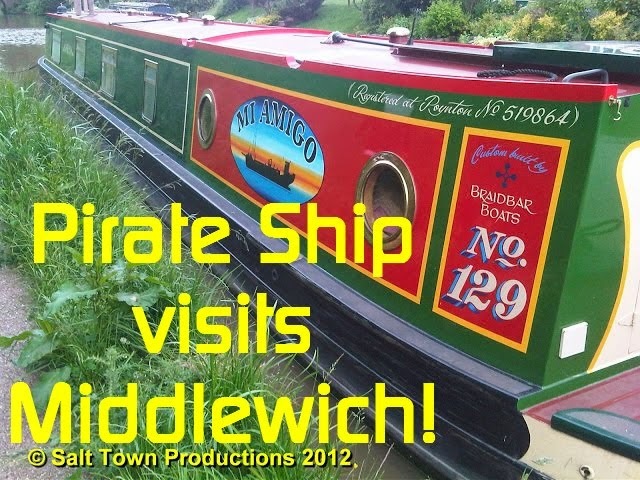 BILL: By the way, I've received another letter of complaint from Middlewich? BILL: It's a small town on the edge of the borough. NIGEL: Oh yes, I remember. I thought we'd demolished it. BILL: We tried, but they will keep building new houses. NIGEL: Yes, it's a hard life in local government. What's their problem now? BILL: They have this absurd idea that because they pay high rates they're entitled to the same amenities as the rest of the borough. NIGEL: The very idea! Send them some more hanging baskets! BILL: They say they're fed up with hanging baskets. NIGEL: Ungrateful wretches! Those hanging baskets don't grow on trees, you know. BILL: They say they'd rather have a swimming pool. NIGEL: For Heaven's sake! Why? 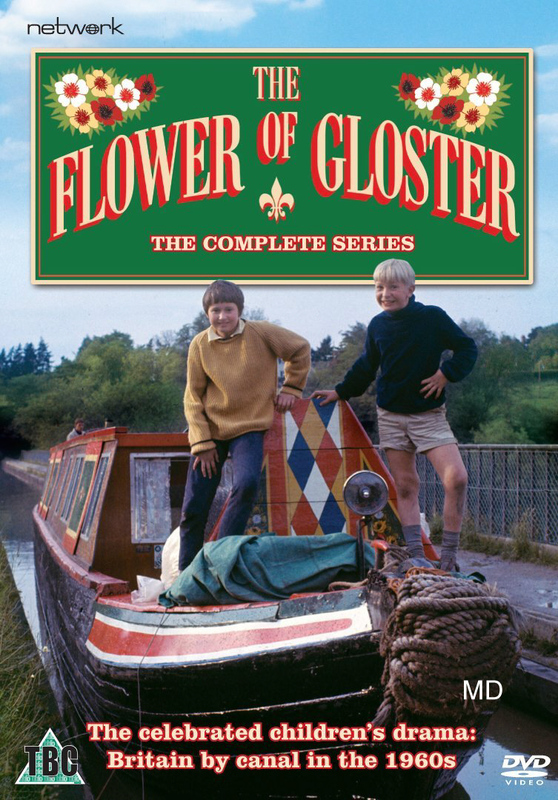 BILL: Because they have two canals and three rivers running through the town. they think their children should have easy access to swimming lessons. NIGEL: They do have a point, but think of the expense. Send them some more hanging baskets! BILL: They say they can't get down Wheelock Street because of all the hanging baskets, and if we send any more they'll throw them in the river. NIGEL: You know, Bill, I sometimes wonder why we bother. Anything else? BILL: They want to know what we intend to do with all the derelict land in Lewin Street. NIGEL: The Council has earmarked that land for a very special purpose. We're going to turn it into a nursery and grow lots of flowers. BILL: What on earth for? NIGEL: To put in the hanging baskets, of course. I do wish you'd think sometimes, Bill. Anyway, back to work. I've been asked to design a new logo for the council. BILL: And what have you come up with? The Sycamore Community Gardens in Warmingham Lane, which were originally due to be opened in June, were eventually opened on Saturday September 1st at 2pm. The opening ceremony was performed by Deputy Town Mayor Bernice Walmsley. As the name implies, this is a community initiative which has turned what was just a piece of waste ground into a beautiful garden for the benefit of pensioners living in the adjacent houses. The main instigators of the scheme were Kath and Barry Walklate, themselves pensioners, who have been delighted with the help and support they have received, not least from the now retired Assistant Town Clerk Stephen Dent who helped them obtain funding from the Big Lottery Fund via the Community Pride Group. 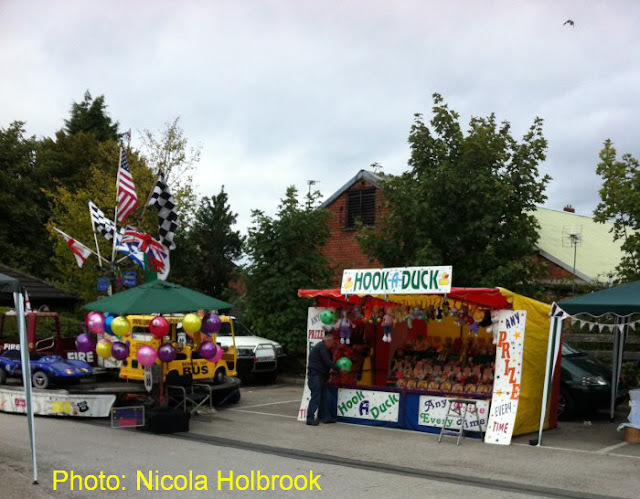 The grand opening featured stalls, a tombola and live music. The opening was based around no. 44 Warmingham Lane. We'd like to congratulate everyone concerned with this wonderful project, not least Kath and Barry who have put many hours of unpaid hard work into it. Bill Eaton has sent us this photograph of part of the old ICI Middlewich Works which he found in a book about the history of the firm. He says, 'the camera man would be standing with his back to the lime beds looking at the back of the works'. This site is now occupied partly by Pochin Ltd and partly by warehousing which was, between 1971 and 2000, ERF's Middlewich Service Centre (Pochin's is on the part of the site nearest to Brooks Lane, and the ex-ERF buildings are at the other end of the site, directly beneath the lime beds. An access road called 'Road Beta' runs from Brooks Lane to the foot of the lime beds. This is the start of the footpath which runs off in the direction of Cledford Lane and was formerly known as 'Poppityjohns'. 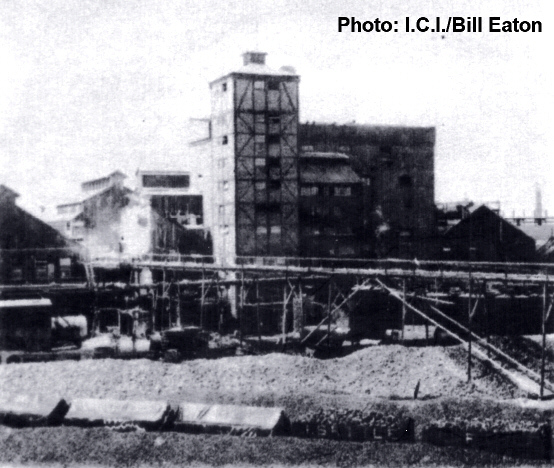 Bill, who worked at the ICI works in the mid-1950s, goes on to say, 'the tall building with the decorative brickwork is the distiller building'. Note the railway wagons in the foreground of the distinctive type used in the salt and chemicals industries, and which we saw an example of here. According to Bill, these wagons would be 'on their way with limestone to feed the kilns'. To enable the modern Middlewichian to get his or her bearings, we should say that the Kings Lock pub and the Trent & Mersey Canal were (and still are) directly behind the buildings in the centre of this picture. The area is, of course, still industrial in nature and Brooks Lane has been transformed over the years into the 'Brooks Lane Industrial Estate' but, in its day, the ICI Works dominated the area in a way that is hard to envisage now, with its massive limestone crushing machinery, its tall chimneys and its many sidings full of railway wagons. An idea of the huge scale of the works is afforded by a piece of information which Bill Eaton gives us about that rather charmingly decorated distiller building. Bill Armsden I remember that place. 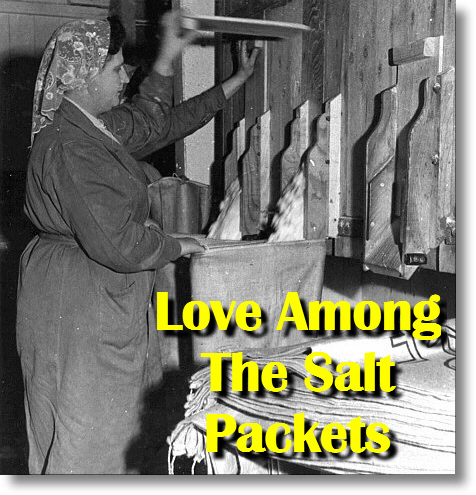 There were always loud crashing noises as if stuff was being dropped down the inside of the tall corrugated building. We lived on Long Lane by the canal and that noise could be heard at our house. It was not an attractive structure at all. Dave Roberts No it wasn't. The whole place was ugly and workmanlike. Which makes it all the more remarkable that they should go to the trouble of putting decorative brickwork on that distiller tower. 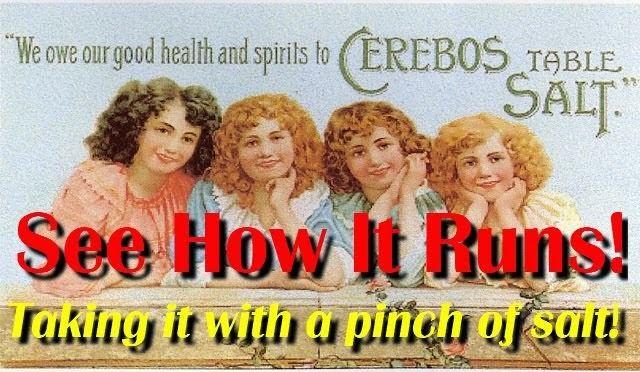 For whose benefit was it? 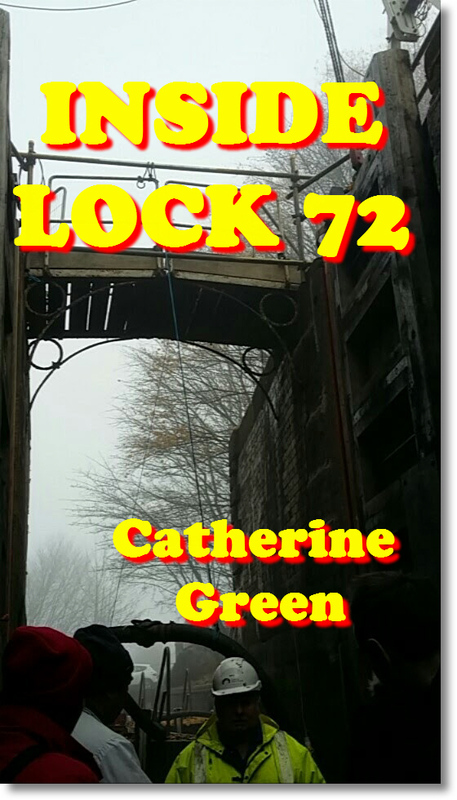 The constant crashing noises would come from the limestone crushing machinery inside the buildings adjoining the canal. Our friends at the Middlewich Guardian are currently running a Fair Play Campaign calling on Cheshire East Council to invest in better and safer play areas for children in Middlewich. 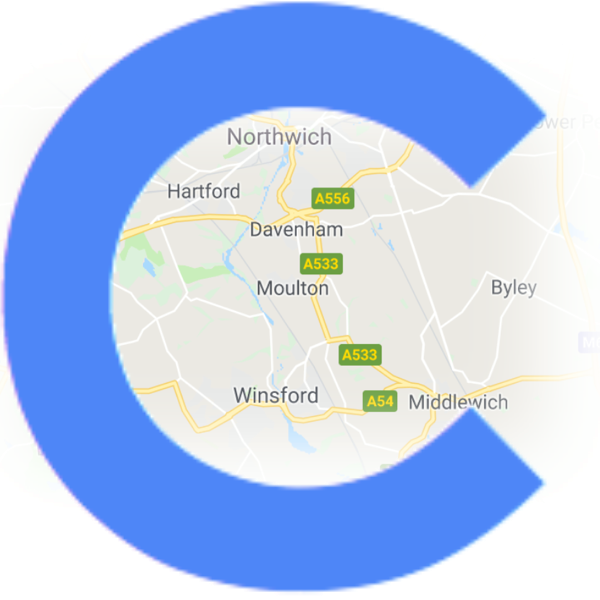 The Campaign features a petition which Middlewich people are being urged to sign in order to highlight the dilapidated condition of the town's playgrounds. There are already over 150 signatures on the petition, but many more are needed. 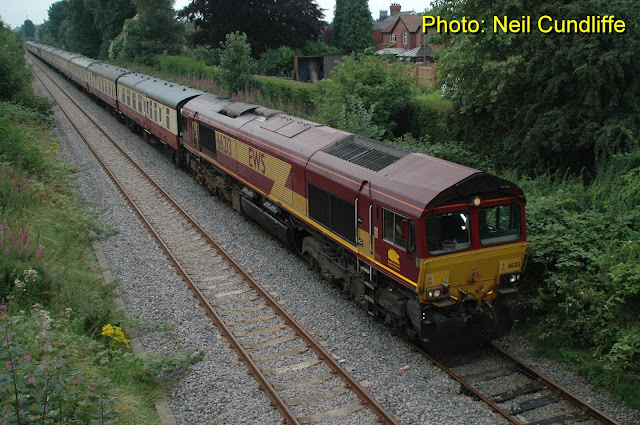 UK Railtours' special train from Basingstoke to Buxton passes through Middlewich on the morning of 11th August 2012. Our sister site, the MRLC website, features some superb photos of the train by Neil Cundliffe. Jenny Hatton: In over thirty years I have never ever seen a train on that line - I thought it was shut! Diane Russell: There are trains using this line every day. 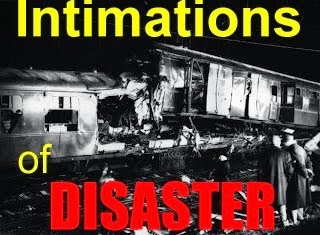 Mostly goods trains, but there is sometimes a Virgin passenger train, if it gets diverted. Jenny Hatton: I may have to take some sandwiches and camp out next to it - seeing is believing! Diane Russell: I live about fifty yards away from it, so I can see them from my kitchen window. 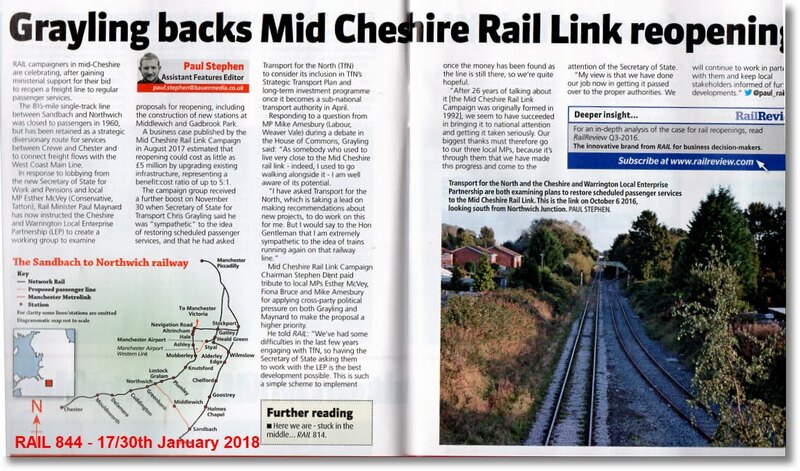 Dave Roberts: The shiny rails are evidence that the line's being used quite frequently at the moment. Neil, who took the photo, tells me he lives close to the line and frequently hears trains rumbling through, particularly at night. Bill Armsden: On a quiet night with the bedroom windows open and a breeze in the right direction, I can hear trains rumbling along the track. Diane Russell: You can more or less set your clock by them, Dave. One about 5pm most days, and then again between 10 and 11pm, and just lately there have been quite a few during the night. I have got used to them now, and it's quite nice hearing them going past, even in the night. Dave Roberts: It brings back memories for me. When I was young and lived across the road in King Street I'd often hear trains running in the night - steam trains from 1959 to 1968 and then diesels. I sometimes hear trains in the night now, but they're mostly on the West Coast Main Line, which isn't too far away.